Most people aged eighty-six spend their time resting. Not Nguyen Van Lan from Ha Tinh. He looks after trees. Casuarina trees. 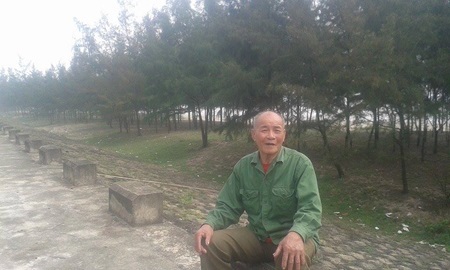 He planted many of them to stop seawater from flooding people's land. Now he looks after them, protecting them from poachers who cut the trees down to sell them as logs. Due to his lack of capital, he sometimes picked up casuarinas seeds and cultivated saplings by himself. Thirty years have now passed and his casuarina forest has spread over 10 hectares, from just one hectare in the beginning. Everyone has a passion, but Nguyen Van Lan has devoted his life to something different – planting the casuarina forest. A passion is something you love so much that you don't mind how much time you spend on it nor how much money you spend on it. A resident of Xuan Hoi Commune is someone who lives there. A dyke is a wall that is built to stop water from flowing into an area. Fishermen's assets are things that fishermen own that could be sold for cash. Obsessed by the dyke breach, I decided to lead my wife and children to set up a tent for housing and plant forests to help retain the soil in the village," he said. If you are obsessed with something, you think more than it is normal to think about it. The dyke breach is the breaking of the dyke. To retain the soil in the village means to keep it there and stop it from being washed away. At first, he borrowed money to buy a boat and gear for fishing. Witnessing people feeling helpless before storms, Lan wrote a letter asking local authorities to grant land along the coast for him to build a protective forest. Witnessing people feeling helpless means seeing them in this state. To purchase trees means to buy them. If casuarina trees reduce the impact of storms on villages, they stop the storms from doing too much damage. In the beginning, many seedlings died because of his lack of experience. Seedlings are young, little plants. Due to his lack of capital, he sometimes picked up casuarinas seeds and cultivated saplings by himself. "Due to" means "because of". "Capital", in this case, means money. To feel depressed means to feel sad and helpless. In 2009, Nghi Xuan district advocated the building of the sea dyke. By advocating the building of the dyke, the district announced that this would be a good idea. Lan was willing to cut down 3ha of casuarina forest, consisting of nearly 500 trees that were 5 years old, to serve the common interest. By cutting down these trees, Lan was serving the common interest because that was what most people believed should be done; even if Lan, deep down, might not have wanted the trees chopped down. Then, he received about VND5 million (US$220) for compensation and took the job no one wanted – dyke security guard with no salary. Compensation means payment for something to make up for a loss. Lan's intention is something he wants and plans to do. By resigning from your job, you choose to no longer work there. "I have the strength, thanks to the casuarina forest, for it acts as a green lung." A green lung is an area with many trees and plants. Trees breathe, giving off oxygen which is why such areas are called green lungs. "But like a lamp glimmers before the sea winds, my inner wish is that someone will take care of the forest after I die," he said. When a lamp glimmers, it shines faintly with a wavering light. 1. When times were tough, Nguyen Van Lan would pick up casuarinas seeds and cultivate saplings rather than buy seedlings. 2. Nguyen Van Lan has even got into fights with people who want to chop down his trees at night and sell them as logs. 3. Nguyen Van Lan and his wife have seven children. 4. Sand does not drift around as much in places where there are casuarina trees. 5. Nguyen Van Lan considered each casuarina tree to be his daughter. 1. True; 2. True; 3. False; 4. True; 5. False.